With the exceptionally warm weather, gardens are blooming everywhere. Since I’m doing tomatoes and jalapenos, mine won’t be planted until the end of the month. The one recipe I make over and over again with my homegrown produce is this Garden Salsa. I learned this recipe back in my high school foods class, so I’ve been making this for…almost 8 years now? Could be 10 even. Anyway, it is a very basic tomato salsa, which takes only 20 minutes to cook on the stove top. If you can chop and stir, you can make this salsa. As you can see by the recipe, this salsa is very pure. Very little seasoning, no cilantro, no lime juice. Your heat factor depends on how many and how mature your jalapenos are. Sometimes my batch is very mild. Other times you are sweating from the heat. 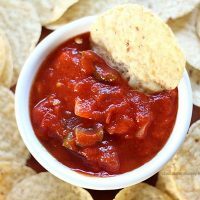 Not only does this salsa make a great companion to nachos, it makes a great sauce when you toss it with some pasta. I prefer tortellini or even ravioli, but spaghetti works well too. 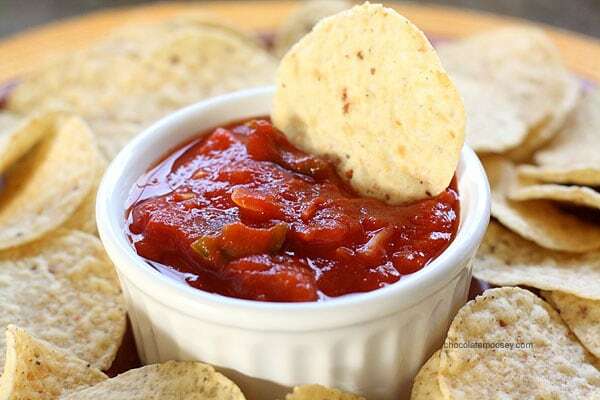 I have made this salsa both with fresh and canned tomatoes. Of course, fresh is preferred, but because the salsa is cooked down, canned is acceptable. If you do use canned, dump both the tomatoes and the juice into the pan. You can also serve it immediately or chill it for a few hours. I prefer it warm, but I’m not going to say no to cold either. Combine all of the ingredients into a large sauce pan. Bring to a boil, reduce to simmer, cover, and cook for 20 minutes. Stir occasionally. Beautiful pictures, as usual! 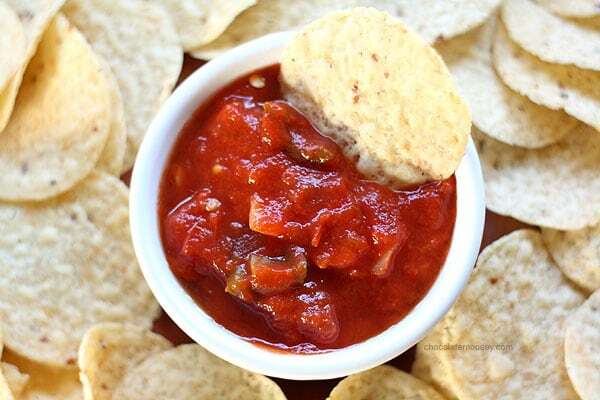 There is nothing better than fresh made salsa – great recipe! This salsa earns you a top spot in my book! YUM! Time for chips and salsa! I’m always looking for homemade salsa recipes. Thanks for sharing this for Sunday Supper. I can’t wait to have something from my garden to harvest so I can make this w/ veggies fresh from the backyard! So wonderfully fresh! I’m learning to love tomatoes and I think I really do need to try salsa. Yours looks so good!